Blaze the trails and bend the trends. 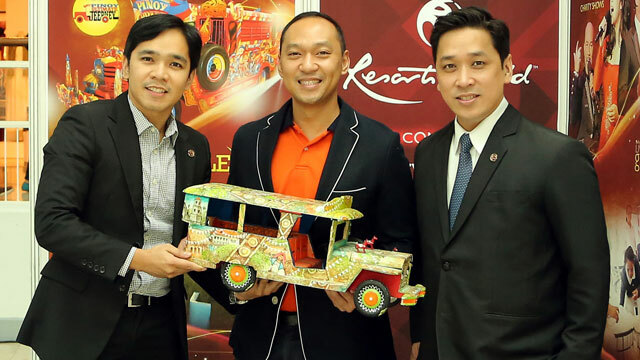 Martin Paz (rightmost) is the Chief Integrated Marketing Officer of Resorts World Manila. Doing business always includes certain risks. With the way the market moves and how consumers pinpoint products they want to patronize, there’s really no accurate way to determine what works and what doesn’t, unless of course through trial and error. While chance factors into the equation, positioning yourself and your business at the right time and at the right place, when consumers finally decide which option to go with, is the key to achieve some vestige of success. Paz is the head of a dynamic group that drives the messages behind Resorts World Manila (RWM). Under his watch, the premier lifestyle and tourism hub has established itself as the Philippines’ pioneering and largest fully-integrated resort, setting the benchmark for an industry that is on the up-and-up. Capturing the attention of your desired market, while keeping your patrons engaged, requires constant innovation in terms of providing new products and better services. RWM, though already on its sixth year in the industry, continuously delivers by developing a brand that caters to a dynamic segment. There’s always something special for RWM guests in terms of dining, entertainment, shopping, and other lifestyle related commodities. However, apart from the actual offerings that customers can avail of, what the property focuses on selling is a vision of the future. Through major developments currently in progress all over the Newport City complex and beyond (Entertainment City), the brand instils a sense of thrill with what’s yet to come. Patrons instinctively respond to this because keeping both prospective and actual clients in the loop, especially about significant movement, immediately shares ownership of the product. Speaking of engaging clients and sharing ownership, having projects propelled by relevant needs significantly adds novelty for a brand. The necessity to develop strong advocacies is top priority because it shows where the heart of the company really lies. Being a fully integrated property, RWM adapts a holistic CSR campaign designed to address three major points, Philippine Tourism and the Arts, Social Development, and Environmental Sustainability. This streamlined approach allows the company to engage in projects, sort it within the scope of a specific advocacy, and share it to the general public. One of the major factors that dictate marketing trends is the advent of technology and it’s ever evolving channels. With majority of audiences now glued on their devices, deploying materials online and mobile avenues is now a must. With a comprehensive website backed up by an intuitive mobile application, RWM employs an efficient and cost effective way to reach out to its patrons. Social media also factors in significantly in RWM’s digital marketing campaign. With millions of Filipinos subscribing to sites such as Facebook, Twitter, Instagram, etc., establishing a social media presence is now mandatory because the channel’s versatility is capable of supporting marketing campaigns in multiple platforms. It also allows guests to interact with the brand first-hand through comments and messaging. While strategy and placement carries significant weight in delivering a brand’s message, one important aspect that is often overlooked is the face-to-face interactions between guests and their host. Taking pride in providing world-class experiences, RWM makes a conscious effort to equip its front liners with the necessary tools to tend to customer needs with utmost care. Apart from constant skills training, personal development and service oriented learning programs are in place so that personnel exhibit professionalism at all times, each serving as ambassadors for the brand. One of the strengths of RWM is its positioning in the market as well as its actual location. Having pioneered the integrated resort industry in the country, RWM has the luxury of setting the benchmark for other business models to follow in terms of facilities, operations, and marketing strategies. Having done so, the brand has developed a product that is capable of catering to high-tiered clients while staying versatile enough to offer something for the mid-ranged market as well. Strategically located right in front of the Ninoy Aquino International Airport (NAIA) Terminal 3, RWM offers easy access to a gamut of lifestyle thrills all under one roof. So, adding in unmatched accessibility with diverse offerings equates to a fool-proof formula for success. Because of the complex business structure of integrated resorts and a highly competitive industry backing it up, RWM takes great lengths in adjusting and re-adjusting its plan of action. While it would be a pleasure to share all of these moves, it wouldn’t be a wise decision from a business point of view to divulge any more details. You never know who’s listening.